“One of the main sources of particulate matter, for example, is agriculture. Once ammonia gets into the air, it combines with other chemicals to form secondary particulate matter. It’s an enormous problem all across the continent,” the Maltese Commissioner told EURACTIV.com. Agricultural air pollution comes mainly in the form of ammonia, which enters the air as gases from fertilisation with products prone to volatilisation and livestock. In total, 94 % of all ammonia emissions in the EU result from agriculture, of which livestock excreta is responsible for the lion’s share – Greenpeace estimates it at almost 80% of the total, while mineral fertiliser application accounts for approximately 20%. The fight for cleaner air is one of the key environmental policy issues of the EU since the late 1970s. The Commission points out that over the last three decades, particular policies have managed to improve air quality throughout Europe. But, emissions from agriculture show the smallest decrease. Ammonia volatilisation into the atmosphere has a negative impact on agriculture, ecosystems and human health and represents a high cost to society. Ammonia, a compound of nitrogen and hydrogen, is a pungent smelling gas and air pollutant causing soil acidification, eutrophication and ground-level ozone. According to the European Nitrogen Assessment, the loss of welfare and effects on human health due to ammonia emissions is estimated at between 2 to 20 euros per kg of ammonia emitted. Others estimate the effects even higher. A revised National Emissions Ceilings (NEC) Directive entered into force on 31 December 2016 and ammonia is part of it. “All member states have to reduce their ammonia emissions by 2020 and 2030 with at least the percentage in the Directive,” an EU official told EURACTIV. The official stressed that the member states have to submit the first national air pollution control programmes no later than 1 April 2019, so they still have a year left to prepare the programmes. “As it is quite a big task and there is the need to consult, it is not something that can be done very fast. So it is no surprise that no programmes have been submitted yet,” the official added. Isabel Proaño, the communications manager at the European Federation of Allergies and Airways Diseases’ Patients Associations (EFA), said patients with chronic diseases such as allergy, asthma and chronic obstructive pulmonary disease (COPD) are looking for an environment that does not compromise their quality of life even more. “Otherwise, the burden of air pollution will continue to fall on people’s health, especially on the lives of respiratory patients, and our society cannot accept the more than 400.000 preventable deaths from the dirty air every year,” Proaño said. Greenpeace says the Common Agricultural Policy (CAP) is not delivering results for the environment. “This is particularly true where the livestock sector is concerned. Increasingly intensive livestock farms emit a lot of pollutants, affecting our air, water and soil. Emissions of ammonia (NH3) are a perfect example,” Greenpeace’s food and agriculture director Marco Contiero told EURACTIV. Referring to new research, he said it proves that the CAP is supporting some of the most polluting livestock farms. As for the post-2020 CAP, which is currently under discussion, Contiero said it should design policies that drive down the production and consumption of livestock products while encouraging the production of plant proteins and the adoption of ecological livestock farming practices. Nitrogen plays a major role in all biological processes and it is essential for life on the planet. For crop production and healthy soil, farmers apply nitrogen in several fertiliser forms, ranging from anhydrous ammonia (NH3) direct application to Urea and Urea ammonium nitrate solutions, all potentially harmful when applied in excessive quantities. When Urea or Urea Ammonium Nitrate (UAN) remains on the surface of the soil for extended periods, soil urease enzymes will start the hydrolysis process, converting the urea to carbon dioxide and ammonia, during which a portion will evaporate as ammonia gas. According to the Gothenburg Protocol, which among others examines the optimal fertiliser use, ammonia emission from fertilisers’ application is dependent on the fertiliser’ type, weather and soil conditions. The proposed guidelines aim at retaining the crucial nitrogen (N) element in the farming system, preventing losses and thus ensuring maximised productivity and reduced environmental impact. “Emissions from urea-based fertilisers are much greater than other fertiliser types because rapid hydrolysis of urea will cause a localised rise of pH,” the Protocol reads. An alternative that can help reduce ammonia emissions from urea-based fertilisers could be urease inhibitors. 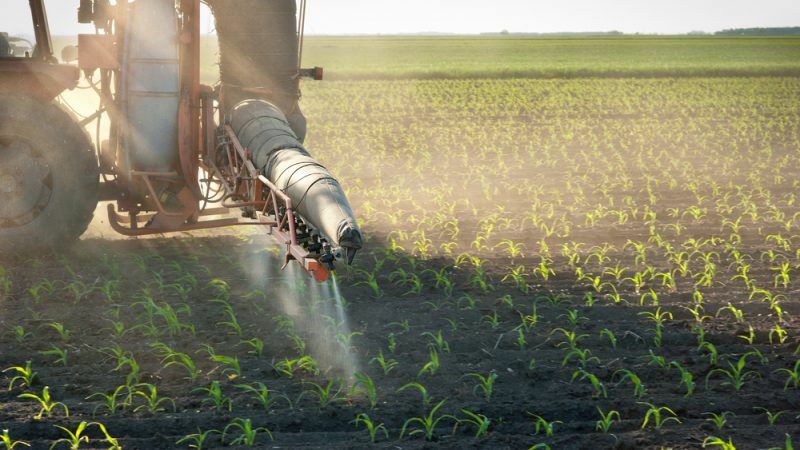 But many stakeholders are concerned about the potentially harmful effects that adding massive amounts of another chemical in agricultural production can bring. Also based on the recommendation of the Gothenburg protocol, others suggest the use of nitrate-based fertilisers, such as ammonium nitrate or calcium ammonium nitrate, as the best way to apply the optimum amount of nitrogen with the right timing. This is done via the use of precision farming tools to reduce losses and enhance N uptake by plants and soil microorganisms. Backers of this alternative say it wouldn’t bring further chemicals into agriculture along with the nutrients. The Protocol stresses that the ammonia emissions from non-urea fertilisers are low, although minor volatilisation may occur partly as a result of direct fertiliser emission and partly from indirect emission resulting from plants as a consequence of fertilisation. In Europe, a big share of the fertilisers is already nitrate-based, which could become an advantage for EU farmers, who can leverage on lower emissions per tonne of food than farmers of other regions. However, other nitrogen-containing fertiliser which is particularly prone to volatilisation, like urea and UAN, have an important share of the market, mainly due to its low cost. “The risk of N-fertiliser loss is large dependant on soil and climate conditions, root structure, preceding crop and crop residue in the field, type of fertilizer and whether a stabilizer is used, so farmers should be very careful with the type of N fertiliser they chose to avoid N losses in the environment and N gaseous emissions. Nitrification inhibitors could be selectively used to control nitrifying bacteria and the production of nitrates that are easily leached in the uderground water. The time of N application is another prime factor that could determine N gaseous emissions in the environment as N applications after rainfall could increase nitrous oxide (N20) emissions. Lastly, a combination of N fertilisers could also reduce the N gaseous emissions and N losses through manipulation of the nitrifying and denitrifying processes in the soil, leading in fewer emissions and environmental pollution,” she added.